Mission: Inventing the future of flight, lifting people up and bringing them home safely. 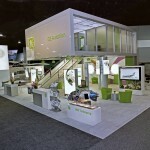 To create a 2500 square foot exhibit for GE at the largest North American show – NBAA. 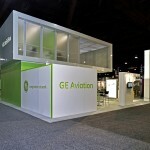 To use the new GE Aviation color palette in an attractive way to highlight their aviation technology and innovation. To provide a financially creative rental concept. 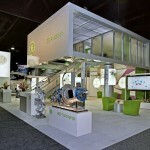 Created an open environment with an interesting booth structure and adding lighting to create focal points. 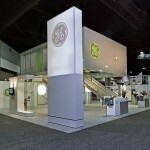 Incorporated subtle hues of gray on clean white backgrounds to help to accentuate the new GE Aviation color palette. 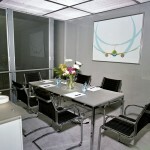 Designed and produced a double deck structure for upper conference room and special accent downlighting. Provided backlit tension fabric and large corporate ID on main aisle. 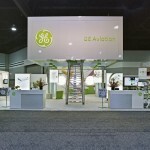 ADEX invested in a unique cantilevered double deck structure providing GE Aviation a 3 year rental agreement meeting their reduction in cap X dollars. This willingness of ADEX to invest in clients speaks to our problem solving and customer service. Our commitment to innovation is consistent with the same entrepreneurial spirit ADEX was founded on and drives our continued growth.